and amazing 3D graphics. 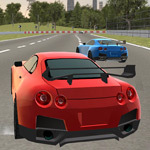 Drive powerfull cars around various race tracks and win all apponent drivers. Take a part in a car racing championship. Drive fast to beat all the opponents and finish the race as first. which are required to unlock more tracks.